Ernst Jorgensen, the respected keeper of Elvis’ musical legacy, was interviewed on Sirius Elvis Radio at the weekend. He made some interesting comments, mentioning the discovery of a new 1956 concert, as well as assuring one & all that FTD still had a definitive mission statement. 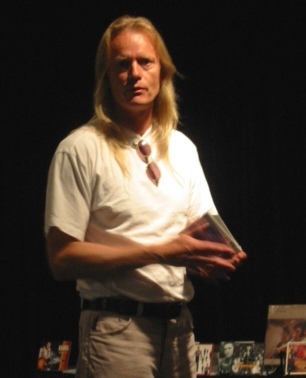 Sirius Radio DJ, 'Doc Walker' – Joining us right now via telephone is Follow That Dream’s Ernst Jorgensen. How are you doing Ernst? Ernst - Well I’m doing better! I have actually been quite sick for a while, which a lot of the fans know, but I’m recovering, so I’m enjoying being on the show again. Doc– Tell us about ‘Summer Festival’, the FTD new release soundboard recording? E.J – The basic idea of our releases of soundboard recordings is obviously to cover from a historical perspective all of Elvis’ Las Vegas engagements, Lake Tahoe engagements and concert tours in the seventies. Unfortunately RCA only recorded (professionally) on a handful of occasions, and to really make sure that history is preserved and available to the fans, that’s why we release the soundboards. On this particular album called ‘Summer Festival’ we didn’t have a lot of soundboards, it was down to the choice of 5 shows that were available to us. We picked this one, first of all because it was a very good show, secondly it hasn’t been bootlegged. Then we added to the show, getting a little extra excitement in there, we added the songs that Elvis didn’t sing in this show but that he sang in the other 4 shows available to us. Doc - So there’s only 4 or5 more of these soundboards available, or from that particular Las Vegas season? E.J – From that particular Las Vegas season in August of 72. The repertoire is basically a cross between what Elvis did at the Madison Square Garden concerts which was just 2 months earlier and ‘Aloha from Hawaii’ which followed in January of ’73. But there are some unusual songs here that weren’t covered on any of these albums, like Little Sister/Get Back medley, It’s Over and there’s a lot of great performances. 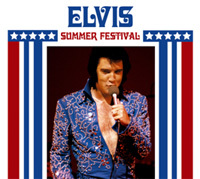 Elvis is in great spirits during this engagement, which was called Summer Festival. And I think we see Elvis at the peak of his seventies career is the years maybe 70/72 through to ‘Aloha from Hawaii’, and it’s a very nice selection of classic Elvis rock’n’roll songs from the past like Teddy Bear, Don’t be Cruel, I Got a Woman… and favourites of the time from 1972, like ‘You Don’t Have to say you Love Me’ and ‘You’ve Lost That Loving Feeling’, ‘Until it’s Time for You To Go’. Doc- How many soundboard recordings exist from 1969 to 1977 on all those different Elvis Tours? E.J – There’s about 200 in total & obviously we’re never going to release all the 200. Obviously the shows are very similar night after night, although Elvis was a very inspired person who changed the songs around and sometimes even (laughing) threw songs in that nobody had rehearsed! So our primary goal is to cover every engagement and every tour with one CD, and if any of the particular engagements or tours have enough interesting material for a record releases we may release one or two more form a certain Las Vegas engagement. Some seasons were more conservative than others, meaning in this context that they stuck to the basic track-listing and only changed one or two songs where as other engagements like the one in August 74 started with Elvis re-arranging his complete repertoire and then changing it back again 3 days later! Doc - I really enjoyed the 1969 concerts. Live At the International & All Shook Up, how many of those were recorded by RCA? E.J - They recorded for a week, 2 shows every night. Those were recorded by RCA & exist in multi-track format, which was 8 track in 1969. We have released several of these both by RCA and FTD. There may actually be enough material from 69 to do yet another album but the question is do we want to have a complete album of a complete show or do we want to take the best songs of the remaining shows. You can get the fans arguing over this forever. Doc – They love to argue about that kinda’ stuff. E.J – It’s good for arguing. That’s the good thing about music is that we don’t have to agree, That’s the wonderful thing about it. Doc– Are there any fifties shows slated for FTD release? E.J – The problem with the fifties is that, as most fans know, is that recording live in those days was not a regular thing and RCA never recorded him. And so whatever was recorded was by personal initiative by DJs at local radio stations. On RCA we released the Las Vegas concert from 56 and more recently a show from Little Rock in ’56. But there is not a lot available and that is part of what we do, we keep tracking down people trying to find stuff and very rarely do we get lucky. We love to have shows that document Elvis as the King of Rock'n'Roll in ’56 & 57. We’ve located one show from ’56 that we’re looking into and we’ll see if we can get that to come together as a deal & a package. We’re desperately looking for anything from 57 and also obviously earlier stiff from when Elvis was still at Sun. At least he was on the radio a lot because he was on the Louisiana Hayride but apparently very few recordings have survived from the Hayride Shows. But we would love to get our hands on some, so if some of the listeners know of anything, please let us know. Doc – Are there any shows that are longer than the Little Rock show of only seven songs? E.J – We are hoping to get a longer show of like 8 or 9 songs long to get variety. There is a rumour, just to tell you the madness of it all, there is a rumour that Elvis in 57 at one of his shows played a song that he never recorded, called ‘Fools Hall Of Fame’. Obviously that’s main target. Another song that early Elvis fans remember that Elvis sang over a 6 month period, but unfortunately not at the Little Rock show, is a cover of The Platters ‘ Only You’. Those who heard him sing it just say that he sang it so beautifully. Doc– So what’s the next FTD release going to be after Summer Festival? E.J – This is why we keep the Message Boards alive, because we don’t reveal that. I’m saying that jokingly - but the main thing is that we do not decide what the next release is until 2 months before we put it out. We have not decided what the January release is. We are also committed remember to re-releasing Elvis’ original albums in the deluxe packages 7" packages with extra tracks and maybe 2 discs. So that all of Elvis’ original LPs will eventually be available to the collector in these very nice pretty packages with a ton of information & extra tracks. So we’re working on those and other ideas. Eventually obviously the well will run dry, not on soundboards but there are only so many studio outtakes that are left not released. We try & vary what we release, soundboards, RCA live recordings, TV shows & Studio sessions. We are working on some of the classic albums. We’re restoring the "Loving You’ album into a 2 CD package. Because we recently found a handful of top-quality unreleased, alternate versions of the songs from Loving You. We are also working on re-doing ‘Something For Everybody’ as a follow-up to the very successful re-release of ‘Elvis Is Back’. So that’s’ a little about what goes on but just now we’re both working on RCA things. It a question for both Roger Semon & I who run the FTD label of squeezing in time for FTD that is a ‘hobby like’ side business, as our main work is with Sony BMG and the RCA label on Elvis stuff & obviously working with EPE on joint projects. Doc – So what’s coming up next from Sony/Bmg? E.J - (Laughing) Hey, you can’t ask me those questions! That has to come out of the publicity office in New York. I got off very easily on that one right?! I think that was a trap! Doc – Tell me how you & Roger approach your work with the Elvis catalogue FTD and Sony/Bmg? E.J – Basically Roger & I work on all the packages with our group in New York. We are a bunch of people working under Joe Dimuro who runs the Elvis catalogue as one of his tasks within the company. We each do our part. My part is mainly to arrange the audio element and audio related information & historical information, somebody else deals with all the other aspects and Roger is very much into the artwork and the photo situation. It’s really is a combined effort where we all need each other. It’s a relatively small group, there are no luxuries of big staff in record companies any more. Sometimes we work many hours on certain days on the main Sony/BMG projects and we have to wait and do FTD in our free time on the weekends! I’m not complaining it’s just a description of how we don’t sit around for weeks & weeks planning the next FTD release because we don’t have that much time. Note - EIN would like to thank the Web Master of ElvisSessions for posting the interview.